Michelle Wilson, Nick Blakely's mother, bravely explains her life after unexpectedly losing a child to sudden cardiac arrest. 3 precious minutes can mean life or death during sudden cardiac arrest, just like it did for these 2 basketball moms. 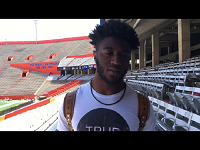 Florida football signee Randy Russell reflects on the heart condition that prevents him from playing for the Gators, and discusses how he's coping with the life-altering diagnosis. Clayton Pendergrass went into cardiac arrest during a basketball scrimmage game. Because there was an AED nearby at the school, an off duty EMT was able to locate and use the AED to save his life. The mission of SafeBeat is to help prevent needless deaths due from sudden cardiac arrest. These parents describe what they miss most about the loved one that they lost due to sudden cardiac death.